Hundreds of invasive species arrive accidentally in the ballast water on ships. Protect Oceans And Jobs is an advocate for the Vessel Incidental Discharge Act, federal legislation commonly referred to as VIDA. This legislation is an attempt to do three things: 1) set a single national standard for managing ballast water, 2) set non-regulatory best management practices (BMPs) for 35 discharges deemed incidental to the normal operations of vessels, and 3) streamline compliance and reporting requirements when vessels move from state to state. Iterations of this legislation have been introduced in Congress for several years and it is an issue of great importance to all states. In Hawaii, more than 400 marine alien species have become established, and the vast majority of these species arrive accidentally in ballast water (the seawater pumped into and out of ballast tanks to stabilize vessels — this water can contain and transport pathogenic diseases and aquatic invasive species) and biofouling (the organisms growing on the outside surfaces of vessels that are exposed to sea water). While there are some “strong and clear regulations” written into VIDA, there are also some provisions that leave Hawaii’s coastal waters unprotected with respect to invasive species and water quality. A political fight has developed over whether cargo ships — and some commercial fishing vessels — should be exempted from regulations governing water ballast discharge. For example, VIDA states that state authorities will not be able to enforce ballast water discharge standards as this authority is transferred to the United States Coast Guard. While the state possesses the expertise and instrumentation to perform thorough ballast water compliance assessments, under VIDA, the Hawaii Department of Land and Natural Resources would be preempted from performing these duties as well as managing interisland introductions of aquatic alien species, especially from harbors like Honolulu Harbor and Pearl Harbor that act as hubs for aquatic alien species. Also, of particular concern, is language that would install unenforceable BMPs for addressing incidental discharges. There are 35 listed discharges that are “incidental to the normal operation of a vessel,” and one is “hull husbandry effluent,” which is the sludge that gets released during vessel in-water cleaning, often including alien species and antifouling hull paint. Under VIDA it would be legal to discharge this potentially harmful sludge into Hawaii waters. On this issue, DLNR is advocating for the development of enforceable and scientifically backed compliance standards for addressing biofouling and protecting water quality, not voluntary best management practices. One of the most concerning pieces of VIDA is its exemption of fishing vessels of any size and commercial vessels under 79 feet from any federal regulation of the 35 classes of incidental discharge listed in VIDA, excluding ballast water. In other words, VIDA completely exempts these classes of vessels from both state and federal regulations and would allow these vessels to freely discharge 34 environmentally harmful discharges without enforcement. In this case, VIDA clearly overreaches and leaves the state’s sensitive nearshore waters and coral reef ecosystems in danger. DLNR takes seriously its mandate to preserve Hawaii’s natural and cultural resources for present and future generations. These resources are also critical for putting food on the table and sustaining local jobs and a healthy economy for residents. 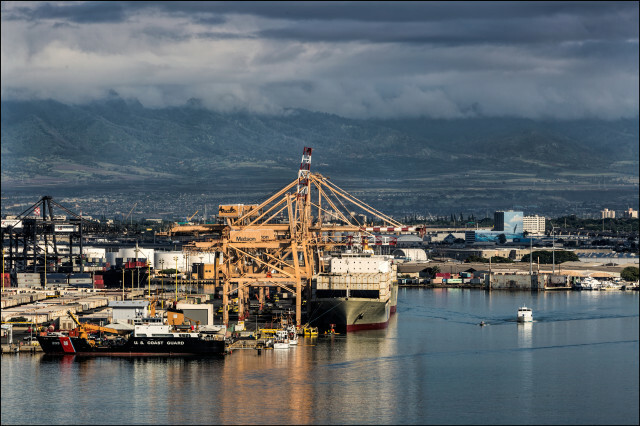 DLNR has seen significant improvements to VIDA over time and would like to continue working with Hawaii’s congressional delegation to mold VIDA into legislation that dually meets the needs of the shipping industry and protects Hawaii’s aquatic resources from vessel pollutants. Andrew Porter is the Aquatic Invasive Species Legal Fellow with the Coordinating Group on Alien Pest Species (CGAPS). Julie “Jules” Kuo is the Hawaii Ballast Water & Hull Fouling Coordinator with the Hawaii Department of Land and Natural Resources, Division of Aquatic Resources in cooperation with the Pacific Cooperative Studies Unit.